RETN Cloud Connect services provide dedicated private connections to major cloud service providers in a simple and efficient manner. Nowadays more and more enterprises require access to cloud platforms to improve their business effectiveness by utilising the ever increasing range of services. Solutions include data storage, backup and recovery to more complicated services based on configurable computing resources (networks, applications, virtual web servers etc.). 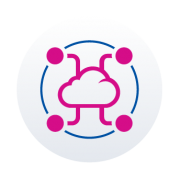 The RETN Cloud Connect enables you to take benefit of the latest cloud computing technologies by establishing a dedicated, reliable and secure connection between your own local network infrastructure and major cloud service providers, thus saving you time and effort as well as physical and monetary investments. As an official Microsoft ExpressRoute partner RETN enables its customers to connect their own infrastructure to the Microsoft Azure Cloud and gain access to Azure services. The reliable point-to-point connection is made by dedicated circuits with capacity up to 10G or nx10G for heavy users. By connecting to RETN’s international backbone you bypass the public Internet to utilize dedicated circuits which are highly secure and safeguarded by SLAs. Predictable latency, performance and high-availability are provided by RETN’s international network and the redundancy of each connection in accordance with Microsoft’s requirements.